Pro Publica shares a construction industry group’s power point on how wonderful the Trump administration is for The Bosses, even if it is run like a bad family business. 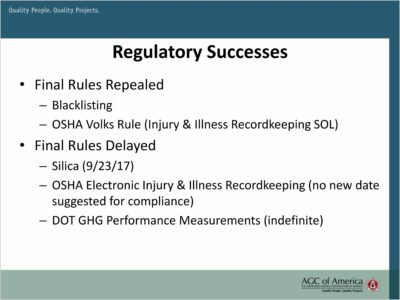 Following the descriptions of the administration’s dysfunction, the PowerPoint pivots to describing what it characterized as major successes in the construction industry’s “regulatory roll back” agenda since Trump entered office. “With President Trump in office, there are many Obama administration executive orders, rules, and other requirements in AGC’s crosshairs,” it says. The “blacklisting” rule refers to President Obama’s “Fair Pay, Safe Workplaces” executive order that required companies bidding on federal contracts to disclose labor law violations. That rule has been repealed by the Trump administration. The so-called Volks rule increased the ability of the Occupational Safety and Health Administration (OSHA) to enforce requirements that employers keep records of injuries and illnesses. That rule has also been eliminated. The silica regulation lowers the permissible exposure limit of silica dust that construction workers can be exposed to on the job. According to OSHA, inhaling silica can cause cancer and other fatal diseases. That regulation’s implementation was delayed but has since gone into effect. The “GHG” rule is a Department of Transportation greenhouse gas regulation aimed at getting data on emissions from vehicles traveling on federally funded highways. The Trump administration initially delayed the rule’s implementation and has since started the process of repealing it entirely. They’re corrupt and autocratic and incompetent, but by god they’re getting rid of all those pesky worker safety and environmental protection rules. More $$ for The Bosses! The OSHA rules are one reason young men are less likely to die in industrial accidents than they did 100 years ago. (Now there will be women, too, since the workforce has changed). What next? We get back to the day when women often died in childbirth? There seem to be a lot of people who want to go backward to the so-called golden era of the 1880s, where business did pretty much what it wanted. Of course, these days a lot of those people working those industrial jobs do not have white faces, so maybe that’s part of the GOP plan. Establish white hegemony by attrition.